Epic Games this week has announced the unveiling of the Epic Games store, a new digital distribution platform that aims to court third party developers and publishers with lucrative rates. The digital platform will launch with a library of hand-curated titles on PC and Mac and will eventually expand to Android and other open platforms throughout 2019. What Epic is offering is a platform where developers take a cool 88% cut of revenue. 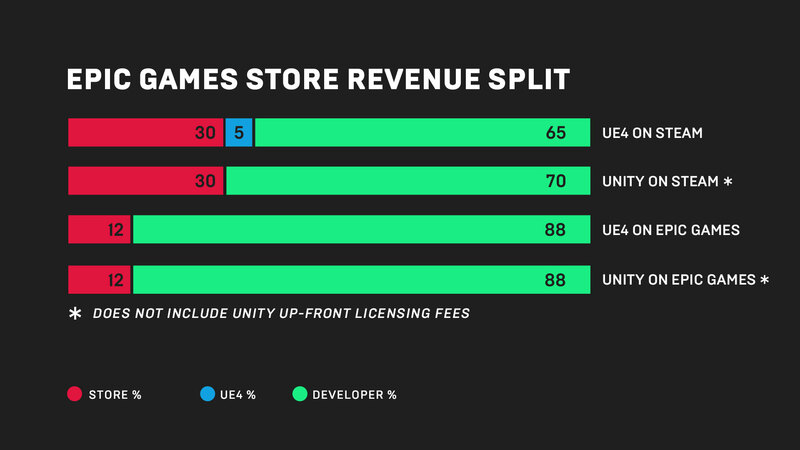 This puts the platform in stark contrast to Steam where the developer takes home 70% (65% if using the Unreal engine). For developers using the Unreal engine, Epic is willing to eat the usual 5% royalty fee. Epic also promises that developers will have control of their news feed with no store-placed ads or cross-marketing of competing games visible. More information on Epic’s store will be available on December 6 at the Game Awards.